If you’re a trend-watcher, you’ll know that Jordan will be big travel news for 2019. Dubbed the Middle East’s Oasis of Calm, this fascinating destination is safe, just a five-hour flight from the UK and is packed with more than its fair share of world-heritage sites and ‘Lawrence of Arabia’ scenery. In recent years, it’s been slowly woo-ing back visitors, but now, the word is out: Jordan looks set on welcoming 7 million visitors by 2020. If you’d like to beat the rush (although for those who know us, we’ve been perennial, steadfast fans), then take a look at the myriad of things there are to see and do there. We’ve selected our top ten things to do in Jordan with kids to give you a taster (or jump straight to our Jordan family holidays section if you want to get cracking on planning a trip). You might think that Italy, specifically Rome, would be the only place in the world where a Roman army, gladiators and chariot racing performances can be experienced in a genuine setting….. but you’d be wrong. The stunning ruins of Jerash are beautifully preserved and host regular chariot ‘races’, complete with actors dressed in Roman clothing. It’s a history lesson brought to life and a real step back in time when travelling to Jordan with children. If you’re claustrophobic, look away now. Shobak castle, built by Crusader King Baldwin I in 1115, is an imposing sight, perched as it is on a dramatic hill offering amazing views of the surrounding desert – and plenty of opportunity to spot invaders. Whilst it’s an impressive ruin to walk around, and has a fascinating history (repelling several attacks by Saladin) which will be explained by your guide, it’s the 375 steps down a secret passageway that lead to a ladder and ‘escape hatch’ which are the most exciting for kids. Bring a torch and your imagination. 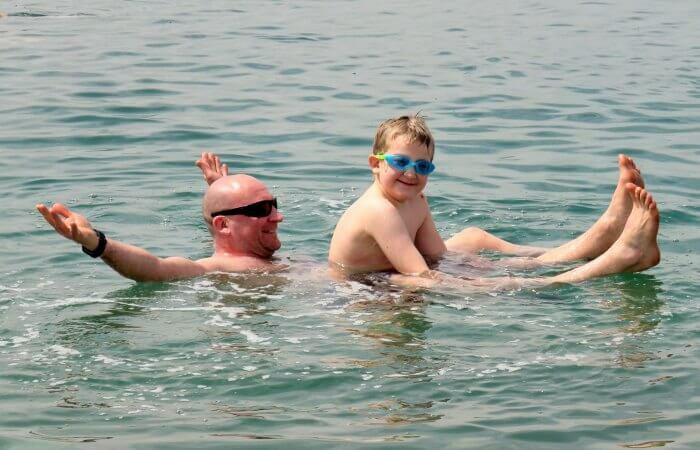 It’s one of Jordan’s most iconic images – people floating, starfish like, on the hypersaline waters of the Dead Sea. 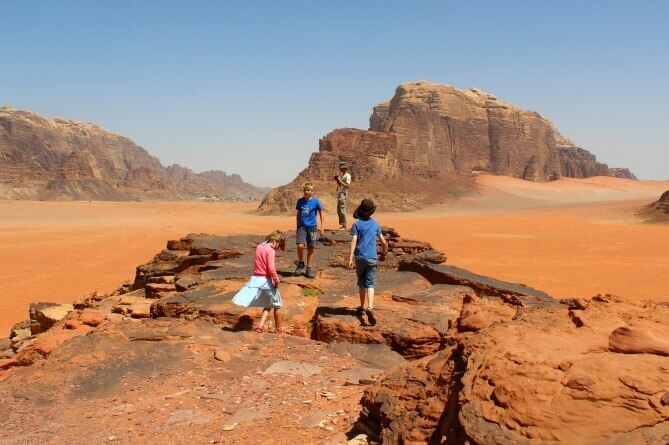 No matter what your age, when travelling to Jordan with kids you’ll love the other-worldly experience. And, if you cover yourself in the therapeutic mud beforehand, you might emerge looking twenty years younger. It’s the most famous of Jordan’s highlights (see our itinerary Highlights of Jordan for more), a vast city carved out of the sandstone more than 2,000 years ago. The kids may not have heard of the Nabateans, who painstakingly carved tombs, facades and temples out of the rose-pink rock, but they may be familiar with the image of the Treasury, immortalised in Indiana Jones and the Last Crusade. Wandering around the 800 individual monuments that include buildings, tombs, baths, funeral halls, temples, arched gateways and colonnaded streets, you’ll be amazed by both its beauty and scale. And if anyone gets tired, you can hitch a lift on a horse, donkey, camel or horse-drawn cart. Click here for 40 historical facts about Petra. For older, more active children, a day hike through Wadi Feynan, one of the largest seasonal river beds in Jordan makes for an almost Mars-like experience. Around 15km in length, you’ll be accompanied by a guide and mule (which can be used for tired children, just in case) through this extraordinary and dramatically beautiful desert valley. Your Bedouin guide will cook flatbread and warm mint tea on a fire for lunch. The trip ends at one the best eco-resorts in the world, described by Forbes magazine as, ‘a shining star among the green lodges worldwide’. 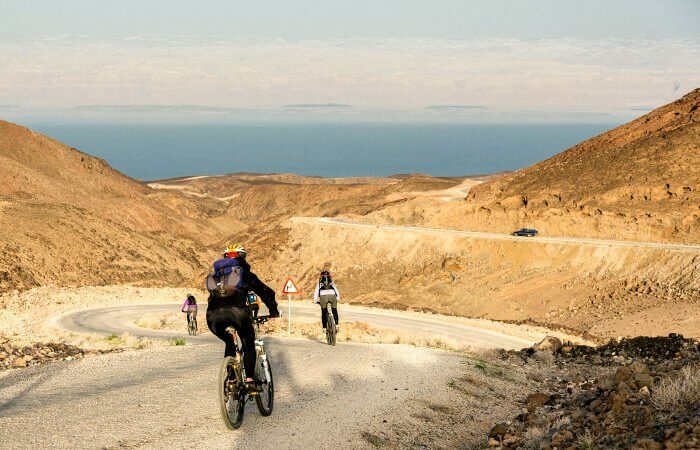 For other examples of what to do with teens, take a look at our ‘Active Jordan for Teens’ sample itinerary. Anyone researching a trip to Jordan with kids, will know that Wadi Rum (aka ‘The Valley of the Moon’) is a country highlight – a jewel in the desert crown. Whilst there’s many ways to experience it (spending the night in a ‘bubble tent’ under the stars a particular highlight) kids will love clambering over the dramatic, red-sand-and-rock scenery, imagining themselves as modern day Lawrences of Arabia. It may be smaller than its larger namesake but ‘Little Petra’, (Siq al-Barid in Arabic) but what it lacks in size, it more than makes up for thanks to its exclusive appeal. Whilst also a Nabatean archaeological site with buildings carved into the sandstone canyons, Little Petra is, unlike its big brother, gloriously crowd free. North of ‘the real’ Petra, and part of the Petra Archaeological Park but accessed separately, you can marvel at its majesty in peace and quiet. Travelling to Jordan with kids (particularly younger ones)? Do go! A trip to any Middle Eastern country should always include a visit to the local souq, a market where your senses will thrill at the sights, sounds, tastes and smells, whether you’re shopping for souvenirs or simply soaking up the unique atmosphere. Whilst the capital, Amman, has the most souqs, every one is a little different, depending on what you want. Al Balad in downtown Amman is the city’s oldest, whilst souq Jara is known for its crafts and food. Here’s a handy article on the capital’s ten best markets and souqs. For more ideas on holidaying in Jordan with kids, see our example Jordan itineraries and check out our Jordan family holidays section. Ring us on 01728 752751 if you’d like to start planning a trip or you can get in touch with us via our website contact page. And if you like the sound of the gladiator show at Jerash, check out this video taken by Stubborn Mule’s Claire Gray. We always love to hear from our customers so do email us with your experiences of travelling in Jordan with kids. Thank you – info@stubbornmuletravel.com.